What is winter burn? Winter burn is a common problem of evergreens including those with broad leaves (e.g., boxwood, holly, rhododendron), needles (e.g., fir, hemlock, pine, spruce, yew) and scale-like leaves (e.g., arborvitae, false cypress, juniper) grown in open, unprotected locations and exposed to severe winter conditions. Evergreen plants that are marginally hardy in a location (i.e., not well-adapted to local winter conditions) are at increased risk for winter burn. Winter burn can be so severe that affected plants may die and/or require replacement. Browning due to winter burn on dwarf Alberta spruce. melts and spring temperatures rise. Foliage starts to brown at the tips of branches with browning progressing inward toward the center of the plant. On broad-leaved evergreens, leaf edges typically brown first, followed by browning of entire leaves. Foliage facing south, southwest or west is most often affected. Symptomatic foliage often begins to drop off starting in spring and continuing through mid-summer as new foliage is produced. In extreme cases, entire plants can brown and die. What causes winter burn? There are many factors that can contribute to winter burn. In general, plants with shallow or poorly-developed root systems that do not efficiently take up water (e.g., recent transplants) are more prone to winter burn. Warm fall temperatures that delay the onset of plant dormancy can also contribute to winter burn. Under such conditions, plants are not prepared for the subsequent rapid onset of freezing winter temperatures, and as a result damage to foliage occurs. Similar cold injury can occur mid-winter when temperatures drop sharply at sunset causing foliage that has warmed during the day to rapidly cool and freeze. In addition, on sunny winter days, foliage (particularly foliage facing the sun) can begin to transpire (i.e., naturally lose water through the foliage). Because the ground is frozen, plant roots cannot take up water and replace the water that has been lost from the foliage. As a result, foliage dries and browns. Foliage under snow or facing away from the sun and direct winds is usually not damaged. Strong winter winds can lead to additional water loss making winter burn more severe. Colder than normal winter temperatures and longer than normal winters can also be factors in the development of winter burn, especially if below normal temperatures occur into April (the time of year when plants normally come out of dormancy and are most susceptible to winter injury). Finally, exposure of plants to salt used to deice roads, driveways and sideways during the winter can make plants more prone to winter burn injury. How do I save a plant with winter burn? 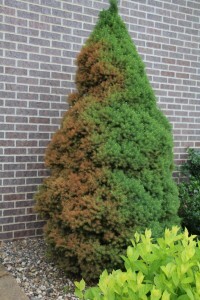 For evergreens such as arborvitaes, boxwoods, junipers and yews, prune out dead, brown, damaged or dying tissue in mid-spring after new foliage is produced. If new foliage has not yet emerged by spring, scratch the bark on affected branches and look for green tissue underneath. Also gently peel back the bud scales to look for inner green bud tissue. If the stem or bud tissue is green, buds on the branch may still break to form new foliage. If the tissue is brown, the branch is most likely dead and you should prune the branch back to a live, lateral bud or branch. Such buds and branches may be far back inside the canopy and pruning may remove a substantial amount of the plant. Pines, spruces and firs typically produce new growth at branch tips in spring that will replace winter burn-damaged needles, and thus pruning may not be required on these evergreens. After a couple of growing seasons, new foliage will fill in the areas that were damaged. If an entire evergreen is brown, recovery is unlikely and the plant should be replaced with something (e.g., a deciduous shrub or tree) that is better-suited to the site. How do I avoid problems with winter burn in the future? Use a variety of strategies to prevent winter burn before winter arrives. Plant the right plant in the right place. Buy plants that are rated as cold hardy for your location and are well-adapted to local growing and soil conditions. Plants exposed to drying winter sun and winds are more likely to be injured. Therefore, avoid planting winter injury sensitive evergreens, particularly those that require shade or that are marginally cold-hardy, in exposed, sunny, windy areas. Plant them on the northeast or east side of a building or in a protected courtyard. Plant boxwoods, hemlocks, rhododendrons, and yews in partial shade to provide them added protection from winter sun and wind. Plant evergreens at the right time of year. Optimally plant evergreens either in early spring (before buds break) or in late summer (i.e., August through September). Evergreens can be planted in the summer if you provide supplemental water. Avoid planting after early October in northern Wisconsin and after mid-October in southern Wisconsin as this will not allow sufficient time for roots to grow adequately before the ground freezes. DO NOT prune evergreens in late summer or early fall. Late season pruning of some non-native evergreens may encourage a flush of new growth that will not harden off properly before winter. 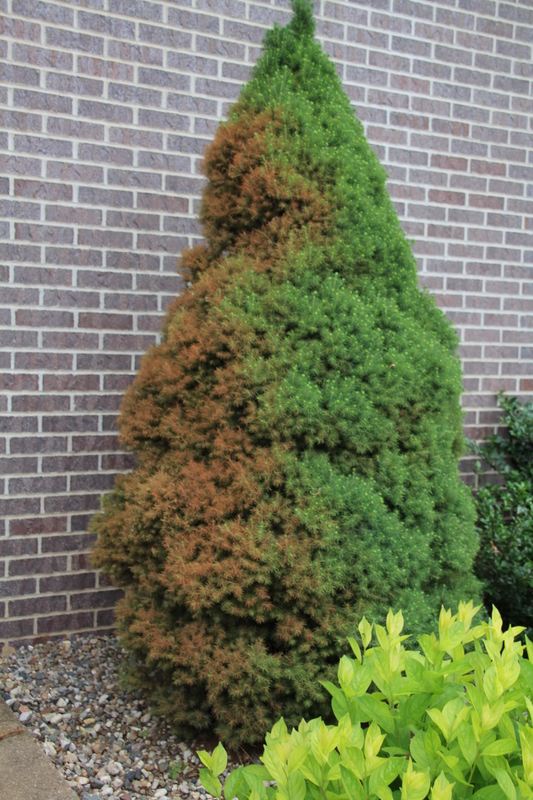 See University of Wisconsin Garden Facts XHT1013 “How to Properly Prune Evergreens” for details on when and how to prune specific evergreen trees and shrubs. Mulch evergreens properly. Apply two inches (on clay soils) to four inches (on sandy soils) of loose mulch (e.g., shredded hardwood, pine, or cedar bark; leaf compost; or wood chips) around the base of evergreens out to at least the drip line (e.g., the edge of where the branches extend). Keep mulch at least three inches away from the trunks of trees and the bases of shrubs. Proper mulch insulates roots from severe fluctuations of soil temperatures and reduces water loss. It also helps protect roots from injury due to heaving that occurs when soils go through cycles of freezing and thawing during the winter. Heaving can especially be a problem for shallow-rooted and newly planted evergreens. DO NOT mulch excessively or too close to plants as this can lead to damage by providing shelter for mice and voles (which can girdle trunks and branches) and by providing a favorable environment for disease development as well as insect activity and feeding. Water plants properly. Plants that are well-hydrated are less prone to winter burn. In particular, newly planted or young evergreens, especially those planted in open, exposed sites, those planted under eaves, or those planted in dry falls may suffer severe moisture loss during the winter and consequently severe winter burn. Established evergreens should receive approximately one inch of water per week and newly transplanted evergreens up to two inches of water per week during the growing season up until the soil freezes in the autumn or there is a significant snowfall. If supplemental watering is needed, use a soaker or drip hose to apply water near the drip lines of plants rather than using a sprinkler. Protect plants during the winter. Use burlap, canvas, snow fencing or other protective materials to create barriers that will protect plants from winter winds and sun. Install four to five foot tall stakes approximately two feet from the drip lines of plants especially on the south and west sides (or any side exposed to wind) and wrap protective materials around the stakes to create “fenced” barriers. Leave the top open. These barriers will deflect the wind and protect plants from direct exposure to the sun. Remove the barrier material promptly in spring. DO NOT tightly wrap individual plants with burlap as this can collect ice, trap moisture and make plants more susceptible to infection by disease-causing organisms. Use of anti-transpirant products to prevent water loss from foliage over the winter has been shown to have limited benefit. These materials degrade rapidly, require reapplication after each significant rain or snow event, and may not be effective in preventing water loss that can lead to winter burn. For more information on winter burn: Contact your county Extension agent.